My Second Life as Amariah Francis: New Releases! New Dollarbie! A SALE! And a coming soon! New Releases! New Dollarbie! A SALE! And a coming soon! This is Absinthe, named after the green fairy, because it is delicate looking and flutters gracefully in the wind as you walk. It comes in 6 beautiful colors, shown above is a light green and navy blue. 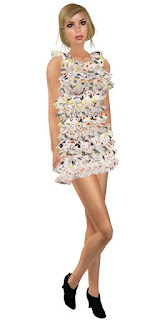 This dress also comes with 2 skirt options a tiered ruffle (shown in blue) and an asymmetrical version (shown in green). Comes in pink, purple, black, red, navy blue and green. 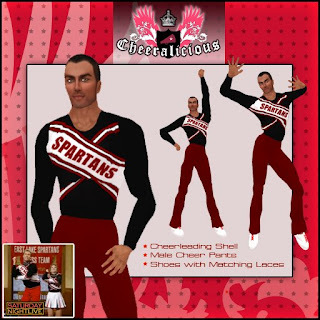 Next, I've added two new uniforms to Cheeralicious! Both are influenced by Saturday Night Live's famous and lovable Spartan cheerleaders! Available in both the male, Greg, version and the female, Arianna version. Uniforms come complete with basic tennis shoes. I've also added a new dollarbie to the store and a whole new dollarbie section I plan on filling up! Terri is the newest addition to that area, it is a strapless pink ribbed terri cloth minidress! The Missy skins and bodies are for sale for ALLOT less than they were! Skins are marked down to $120L each and the megapack with all of them is only $600! With this pricing you can get the entire pack for LESS than the regular price of one! The body pack is only $100L and includes 9 different full mod body shapes, this is a steal! The skin and body pack is now only $645! I'm not sure how long I'll keep these marked down this low, so if you like them get them now.